You'll be £5.20 closer to your next £10.00 credit when you purchase A Visitor's Guide to Georgian England. What's this? Could you successfully be a Georgian? Find yourself immersed in the pivotal world of Georgian England, exciting times to live in as everything was booming; the Industrial Revolution, the Enlightenment, and the nascent Empire; inhabited by Mary Shelley, the Romantic Poets and their contemporaries. However, rather than just wondering about the famous or infamous, you will find everything you need to know in order to survive undetected among the ordinary people. What to wear, how to behave yourself in public, earn a living, and find somewhere to live. Very importantly, you will be given advice on how to stay on the right side of the law, and how to avoid getting seriously ill. Monica Hall creatively awakens this bygone era, filling the pages with all aspects of daily life within the period, calling upon diaries, illustrations, letters, poetry, prose, 18th century laws and archives. This detailed account intimately explores the ever changing lives of those who lived through Britain’s imperial prowess, the birth of modern capitalism, the reverence of the industrial revolution and the upheaval of great political reform and class division. A Visitor’s Guide to Georgian England will appeal to Romantic poetry lovers, social history fans, fiction and drama lovers, students and anyone with an interest in this revolutionary era. 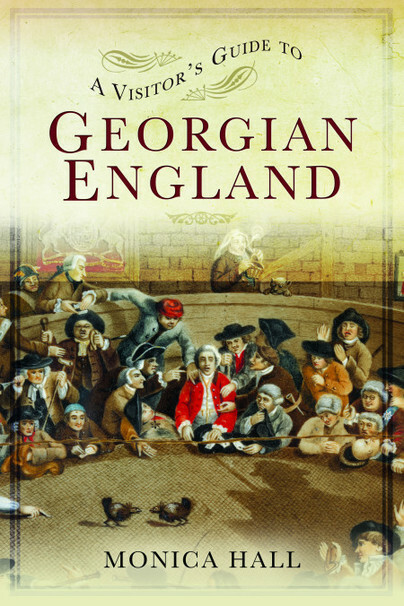 This book is a good way to get an overview of how life was in Georgian London. I like that it used a modern person time traveling as it's premise. My only issue with the book was it was so short, though I did learn a few things about the era. Especially since it's not one that I focus on in my reading of British history. I do recommend it if you have little to no knowledge of the time frame. Monica Hall relives drama, poetry, music, clothes, gambling, etiquette and every other aspect of an exciting slice of history. It's clear that the author is fascinated by the era, and the book is packed full of detail. When I was younger, so much younger than today... I was captivated by Georgette Heyer's Regency romances and wanted to know more about the time in which those people lived. Working in the public library service, I had access to all kinds of bibliographical information, and actually found very little apart from a couple of books published by Batsford. The Georgian period remains one of the most elegant of all our historical periods, the architecture is sublime, the clothes to die for, and now, author Monica Hall has prepared this lavish book aimed at the kind of people who would nowadays want to buy a tourist guide. This is a fantastic piece of social history that fills in a huge number of gaps in our knowledge. First class entertainment and edicational at the same time! Wonderful! I loved this book; I learned something new on every page and the author has done an outstanding job of making the colourful Georgian world come alive in all its contradictory, bawdy, and utterly fascinating glory. This is not a bad little book. It's quite interesting to read about the different parallels between the Georgians and today's society such as their lampooning people via cartoon and our love of memes and twitter posts. We also share with our ancestors a love of eating out which quite surprised me. This is a fun, sometimes funny account of what life was like back in the Georgian era. It's not a stuffy history book but it is informative. It takes in fashion & make up, enlightenment, entertainment, cleanliness and gambling to name a few things and how, as a time traveller we could hope to fit in. A Visitor’s Guide to Georgian England deals at length with the Enlightenment and the great political reforms and upheavals of the time. This is supported by illustrations and reference to the prose and poetry of the period. I found the book of great interest and would certainly recommend it to lovers of history and the simply curious. Very informative and fun trip back in time. You feel like you are actually there. The writing style was lightly humorous and very readable. The book focused more on what was different, so don't expect a complete, detailed look at any subject. However, it was a fun overview of Georgian England with some interesting details thrown in. I'd recommend this book to those interested in how the Georgian's were different (and yet similar) to us. One truly feels as though one is living in Georgian times. Better than a time machine! Monica Hall has spent her working life in marketing and advertising, both in industry and academia. When not making ends meet and raising two sons, however, she has devoted years to delighting in the social history of her favourite era, the Georgians. She has written articles for several online historical resources, including the renowned Madame Gilflurt and Encyclopedia Titanica, as well as reviewing historical books and TV programmes. Monica lives in Hampshire with a cat who seems to have discovered the secret of eternal youth.